Most of the trainers with runners in Saturday's Grade III, $250,000 Sam F. Davis Stakes at Tampa Bay Downs view the mile-and-a-sixteenth race for 3-year-olds on the main track as a wide-open affair. “I think it's a good race for everybody to see what kind of level their horse can compete at,” said Arnaud Delacour, the trainer of Central Park Stakes winner Five Star General. Knicks Go, by contrast, has knocked heads with the best (thus far) of his class, winning the Grade I Claiborne Breeders' Futurity on Oct. 6 at Keeneland and finishing second to the unbeaten Eclipse Award Champion Two-Year-Old Male, Game Winner, in the Sentient Jet Breeders' Cup Juvenile on Nov. 2 at Churchill Downs. That's why the KRA Stud Farm-owned colt is almost certain to be the betting favorite when the field of 10 enters the starting gate for the 11th race on the track's Festival Preview Day 39 Presented by Lambholm South program. He is 5-2 on the morning line. 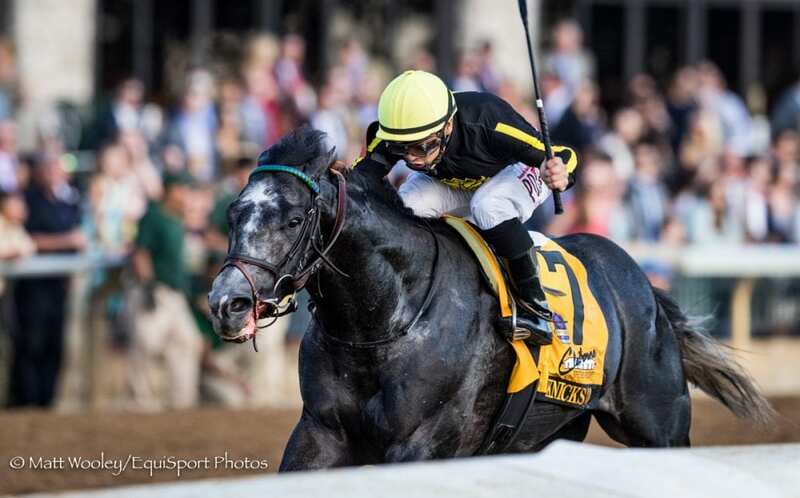 The handsome gray colt Knicks Go will break from the No. 3 post under jockey Albin Jimenez. Post time for Saturday's first race is 12:12 p.m.
Knicks Go's last start resulted in an off-the-board finish in the Grade II Kentucky Jockey Club Stakes on Nov. 24 on a sloppy Churchill Downs track, but the manner in which he has been working in Oldsmar has made that outcome a distant memory. “I'm really happy with the way he's been training,” said trainer Ben Colebrook, referencing a pair of bullet workouts and last Saturday's “maintenance” 4-furlong breeze of 48 seconds that was the fourth-fastest of 64 at the distance. “He's had good energy the last couple of weeks and is starting to get his game face on. Colebrook is confident that no matter who goes to the lead, or if Knicks Go inherits it, Jimenez can avoid a damaging head-to-head duel up front that could compromise his chances. That statement still lends itself to the proposition that the Sam F. Davis could be wide-open, since none of the entrants have raced more than six times and any horse can have an off-day, even one as accomplished and training as well as Eclipse Award finalist Knicks Go. The Sam F. Davis – a “Road to the Kentucky Derby” points race – is one of four stakes, three of them graded, on the 12-race card. This entry was posted in Triple Crown and tagged albin jiminez, arnaud delacour, Ben Colebrook, knicks go, kra stud farm, sam davis, Sam F. Davis, Sam F. Davis Stakes, tampa, tampa bay, tampa bay downs by Press Release. Bookmark the permalink.